While going out for a perfectly crafted cocktail can be fun, multiple $15 drinks can have an unwanted effect on your wallet. You were going to go on a nice weekend getaway? Sorry, you spent all your disposable income on those happy hour Daiquiris made with hand-squeezed lime juice, organic rum and fancy simple syrup. Sometimes it’s nice to pay someone to make you a drink. But you should also treat yourself home-style by building up your home-bar arsenal and making that impeccably crafted Daiquiri. A few of the essentials cost significantly less than those tempting nightly happy hours. Plus, once you’ve mastered the tools, ingredients (start with these) and techniques, all your friends will want to ditch the crowded bars and come to your place. Ready to kick those plastic Solo cups to the curb? Introducing the the four types of glasses and the six essential tools you need to make just about any cocktail at home. Oh, you like Manhattans, Margaritas and Champagne? No need to purchase separate cocktail glasses and Champagne flutes for those high-class tastes. 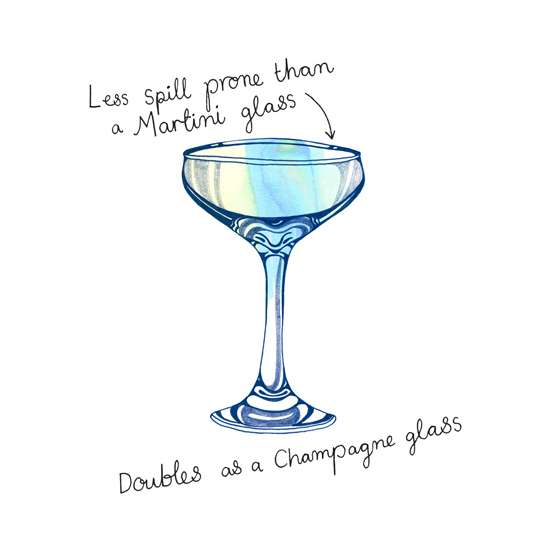 The coupe glass—commonly referred to as a Champagne coupe—was invented as a bubbly receptacle in 17th Century England. Later, it was said to have taken the design of many a royal Brit’s bosom, including Marie Antoinette. Those rumors may or may not be true, but the unique shape of the coupe is nonetheless ideal for a variety of homemade cocktails. Buy it here. As the name implies, this glass commonly houses the ultra-classic Old Fashioned—but doubled in size. It does double-duty in another way: with this glass, there’s no need to own both an Old Fashioned glass and a double Old Fashioned glass. 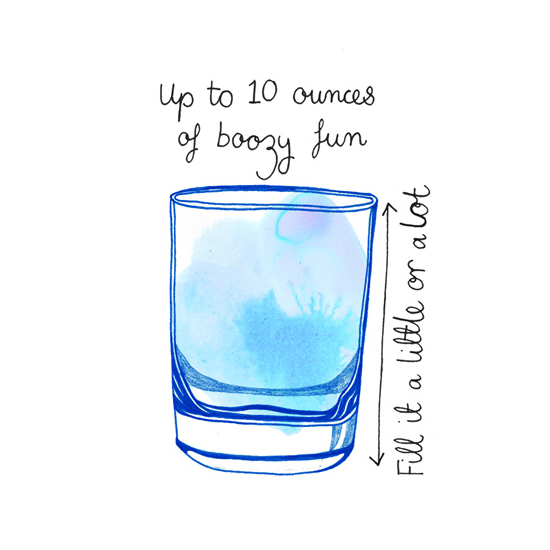 Instead, opt for the larger size, which can hold around 10 ounces of booze, mixer and ice. It doesn’t have to be filled to sloshing. This glass looks enticing filled to just a third, with a nice, big ice cube and a good-lookin’ garnish. Buy it here. Some of the easiest drinks to make while entertaining are made in these slenderly tall glasses and often topped with soda water or tonic. The Collins glass, named after the refreshing Tom Collins, can hold much more liquid than a double Old Fashioned glass, making it ideal for a sturdy pour of gin topped with tonic and everything from Rickeys to Gin Fizzes. Buy it here. Love great brandy and cognac, but don’t have the space for a fancy snifter? Opt for a rocks glass with curved edges. The convex sides give a similar effect to a snifter, encapsulating the aroma. 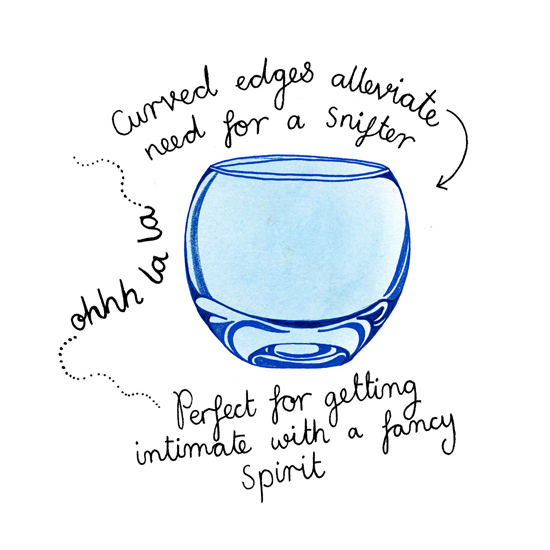 The glass encourages a special bond between you and that very special spirit. These rocks glasses are also great for hosting parties. Repurpose your fancy salad bowl as a punch bowl and use these rocks glasses as punch glasses. No one will know the difference. Buy it here. While having the right glassware is key, having the right tools to make the cocktails properly is, arguably, even more crucial. If you’re a big fan of spirit-forward drinks like the Martini and the Manhattan, a mixing glass is the one tool you can’t skimp on. Be sure to buy one that has a thick, solid base, so it doesn’t scoot around the counter when you’re mixing a drink. Buy it here. Ever notice bartenders behind the stick shaking two cocktails at once? It’s certainly a skill to aspire to. For the home mixologist, one shaker ought to do the trick. 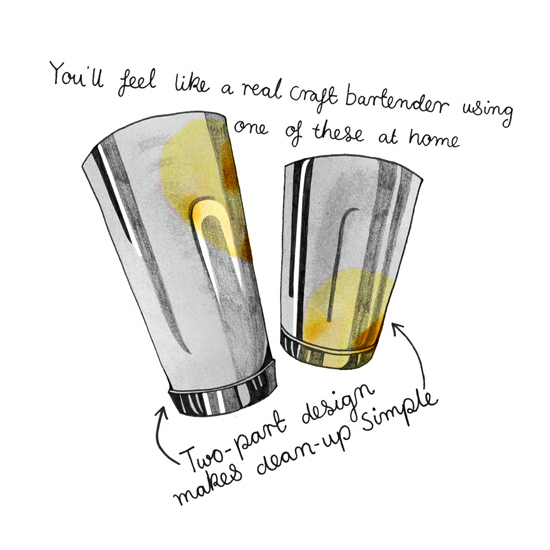 The two-part shaker, like what’s often used in craft-cocktail bars, is as easy to use as it is to clean. Simply employ the larger half to mix together the ingredients, add ice and put on the smaller half at an angle, giving it a good smack to make sure it doesn’t fly off while you’re shaking. That’s a mess no one wants to clean up. Buy it here. If you’ve ever mixed a cocktail before you’ll know that this handy spoon is as important as any mixing vessel. 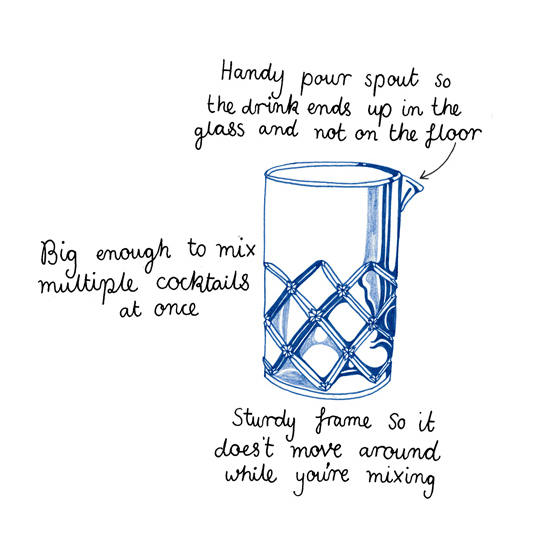 While it’s not terribly useful for eating a bowl of cereal, the extra-long and narrow handle makes it easy to chill and dilute a cocktail in a mixing glass before it’s served. (Check out bartender Evan Zimmerman’s technique.) 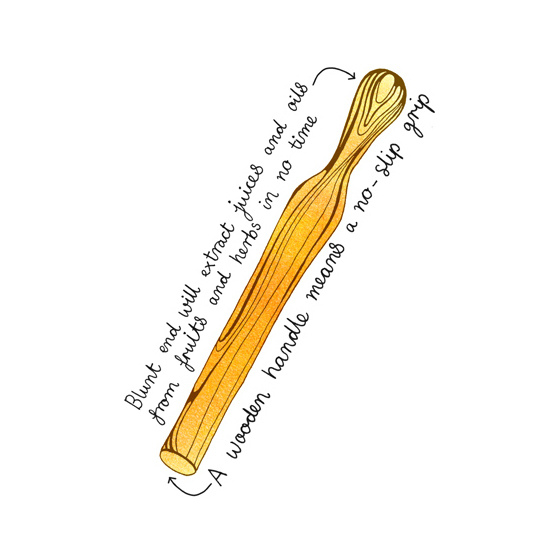 Plus, many recipes call for a “barspoon” of one ingredient or another, so it’s useful to have around even if you are more apt to fix yourself a shaken drink. Buy it here. 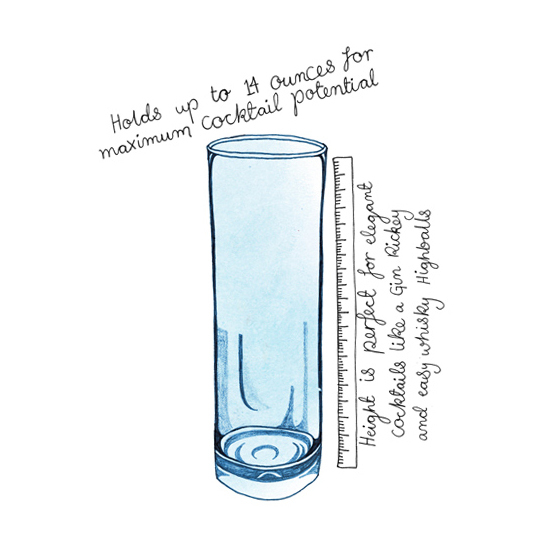 The trick to a cocktail that tastes fantastic every time is mastering the art of the perfect measurement. And the best tool for achieving this is with the humble jigger. 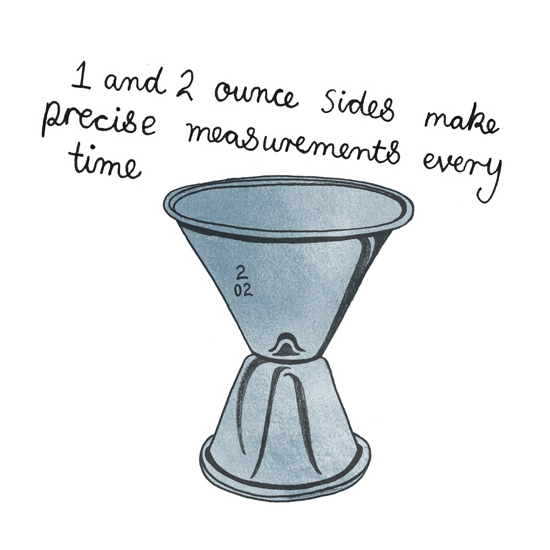 Often with one side measuring one ounce and the other measuring two ounces, it’s simple to measure precisely. Buy it here. Got that mixing glass and spoon and ready to transfer your Martini over to a coupe glass? Well, if you want to do that without a big ka-thunk of ice cubes, invest in a Hawthorne strainer. Named after a bar owned by one of the tool’s inventors, the strainer has been around since the late 1800s. And while, yes, there is also a Julep strainer that is also quite handy, for beginner at-home mixologists, the Hawthorne is a great tricycle. 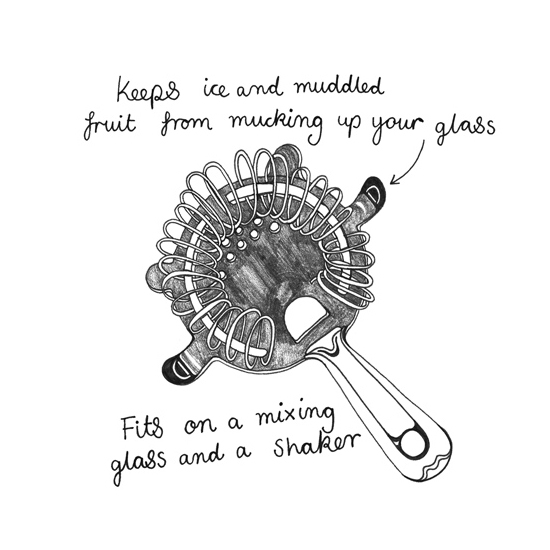 Its simple design fits easily on a mixing glass or shaker to keep ice, muddled fruits and other ingredients from mucking up the bottom of your glass. No one wants a chunk of muddled strawberry hitting them in the face when they take a sip out of an elegant coupe glass. No one. Buy it here. With summer quickly approaching, fresh fruits and herbs are in top form. That means muddled ingredients will be showing up in cocktails on the regular. If you want to emulate some of these drinks at home, buy a wooden muddler. The handle is about as no-slip as you’ll find and the blunt end and stable design make it easy to put as much pressure as needed behind the tool to extract juices and oils—a must if you’re making a South Side or a Caipirinha. Buy it here.